1. In a food processor, combine parmigiano-reggiano, ancovices, egg yolk (no whites), 1 tablespoon of dijon mustard, 2 tablespoons vinegar, and 2 cloves of roasted garlic. Blend. 2. Slowly drizzle in canola oil into the food processor as it is blending. The oil will emulsify with the egg yolk, and the dijon mustard will help it emulsify as well. Pour in around 1-1/4 cups. Check the consistency as you go. Stop when it looks creamy and saucy. 3. To make croutons. Cut a day old, stale piece of bread into cubes. Fry them into a pan with oil and toss them so that each side is cooked evenly. Fry them until they are a golden brown, and then pull off the stove and rest them on some paper towel. 4. 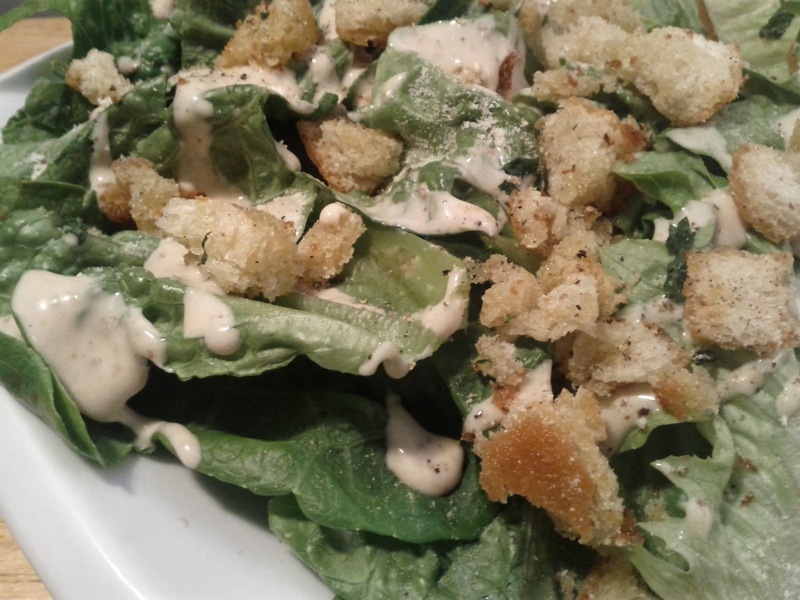 Season the croutons with salt, pepper, and parmigiano-reggiano cheese. You can also use some fresh parsley chopped up if you have it, but it's not really needed. 5. Layer dressing and croutons on top of some chopped up romaine lettuce.